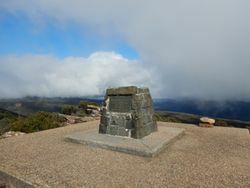 The monument is a stone pedestal with direction finder on the summit commemorating the climbing and naming of the mountain by Major Mitchell in July 1836. The original cairn was replaced in 1963. At the unveiling of the Bulla memorial for Hume and Hovell, Charles Daley the Secretary of the Victorian Historical Society suggested that the idea be extended to to other exploreres and a committee was formed to mark out the routes of Charles Sturt, Thomas Mitchell, Angus McMillan, and Count Paul de Strzelecki. Steps are being taken by the Talbot Shire Council to encourage the movement initiated for the erection of a memorial cairn on Mount Greenock, where Major Mitchell stood on the 26th September, 1836, and made a sketch of the surrounding country. The free use of its hall and personal assistance is promised by the council in connection with the effort being made to raise a fund to build the memorial. There are many reasons why no time should be lost in marking the route of the intrepid explorer through the Shire of Ararat. It is the only shire through which Major Mitchell passed twice on his journey through the Murray to Portland and back. He camped just at the rear of Mr. Archibald's fine property at Pomonal, where a tree was marked by the explorer, and then crossing Long Gully and Boundary Crceks, ascended Mount William by way of the north east slopes of the Black Spur. Here a cairn exists, and all that is necessary is to purchase and affix one of the memorial tablets supplied by the Historical Society. On their return journey, the party erected a cairn on the property of Mr. Lindon, not far from Willaura, but the stones were removed and used for road-making purposes before those who knew their historic value were aware of the intention. Cairns should be built at Mr. Archibald's, at Mr. Lindon's and at Buangor and fitted with inscribed plates. If the tablets were supplied by the Shire Council or the State Schools most directly interested in commemorating the explorer's journey, we feel sure the public spirit of the people would see to the erection of the cairns. It was from the summit of Mount William that Major Mitchell, stretching his hands with a comprehensive sweep to the east towards the great fertile Ninety Mile Plains almost at his feet, said. "Here is a country fit for immediate occupation by man." - "Advertiser." Portland Guardian (Vic), 18 April 1929.